Sharing new finds and information about unique vintage items. 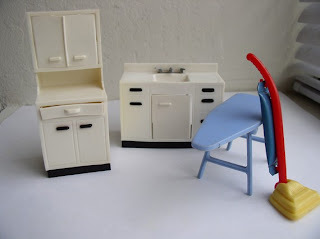 Renwal Manufacturing Company, Inc produced the most highly collectible of all plastic dollhouse furniture from 1945-1956. 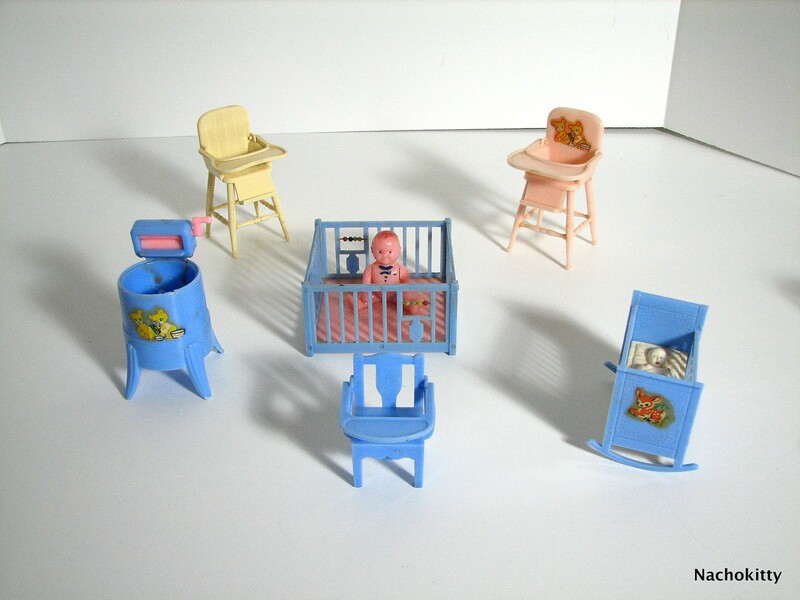 Previous furniture for dollhouses had either wooden pieces or metal pieces. This became almost impossible to produce due to WWII and the shortages of metal. Renwal offered a wonderful alternative, a quality product at affordable prices. The furniture was sold in room sets or by the piece. Back then a child could furnish an entire house for under $7.00. All Renwal pieces are an authentic look at the furniture and life in America during the 1940’s and 1950’s. Many pieces have movable parts, such as dressers with drawers which open and shut and kitchen appliances with movable doors. No other line of plastic dollhouse furniture had more accessories than Renwal. They were as detailed on the back as they were on the front. Everything from telephones to bathroom scales. The rarest piece of Renwal furniture is the broom (121). The piece that merits the most attention is the sewing machine. It is made with 13 separate pieces all glued together. The sewing machine retreated into the table when closed and the needle actually moved up and down when the wheel was turned. No Renwal collection would be complete without this piece, but expect to pay premium price for it. “upholstered” and the beds had spreads which were patterned. Even the bathroom hamper appeared to be made of wicker. Remember that at the end of this series will be our BIG reveal that has been a culmination of work over the past 40 years.. So stay tuned in, and please feel free to comment.